Combining durability and elegance, natural stone is a popular design choice among architects, builders, decorators and homeowners. One other advantage when designing with natural stone? It’s unique. Unlike mass-produced building materials, no two natural stones are alike. Each stone displays distinctive coloring, grain and density. 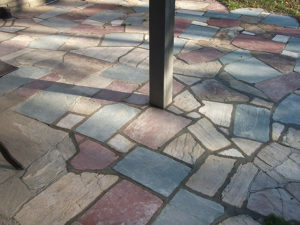 The uniqueness of stone products assures users. They know that when creating with it, no other building or home will have the same look. Natural stone building products come in slabs, tiles or mosaics. It’s also available in individual stones. Choose pebbles or even boulders! For interior designing, natural stone is popular for bath and kitchen countertops, kitchen backsplashes, floors, fireplaces and more. Outdoors, natural stone is often the choice for fireplaces, floors, patios, stairways, walkways and walls. Pebbles, small stones and mosaic tile designs create one-of-kind floor and wall decorations. In fact, mosaic tile designs in natural stone are a great way to add geometric shapes. Use them in modern interiors or with outdoor living spaces. Natural stone not only enhances beauty; it also adds value. It’s an investment that will last for years. It may also increase resale value when it’s time to move. With types of natural stone should you use? You’ll want to consult with your natural stone supplier or natural stone contractor. But here are some suggestions. Designing with granite. Durable and versatile, it displays small mineral flecks and offers endless variations. Granite resists heat, scratches and stains. Designing with limestone. It’s the choice for those who are designing natural. Common uses include flooring, backsplashes and fireplaces. Limestone is also used as cladding for interior and exterior walls. Designing with marble. It’s a classic selection, often showing stunning colors and wonderful patterns. When polished, marble stone is smooth, dramatic and lustrous. Designing with quartzite. A popular choice for countertops, its elements are light in tone. Quartzite colors range from pearl white to gray. Designing with travertine. A beautiful stone, it’s a common building material because of its durability and versatility. Travertine can be used almost anywhere in a home. Specializing in natural stone additions and repairs for exteriors, Cirigliano Masonry serves home and business owners throughout the Pittsburgh area. From design to build, rely on us for brick masonry, pointing and repair as well as indoor and outdoor fireplaces, stone masonry, stone wall repairs and more.